Life is so crazy at the moment that half the time I don't know whether I'm coming or going. It feels like Christmas celebrations have to be very purposeful this year. Taking time to celebrate the season as a family amidst the busyness is a challenge but one that we've been striving towards. The week before Thanksgiving I launched us into our Christmas readalouds to make sure we'd have a chance at enjoying some fun stories throughout the month of December. We began with Keeping Holiday, by Starr Meade. We've read this title before, but our last reading of it was in 2013. Bookworm1 read this independently last year so he had some memory of it. To the youngest among us, this was a brand new story. If you haven't heard of this title the best way I know how to describe it is that it is an allegory, not altogether unlike Pilgrim's Progress, geared towards children. Dylan and Clare are looking for the real town of Holiday and this story documents their journey finding it. 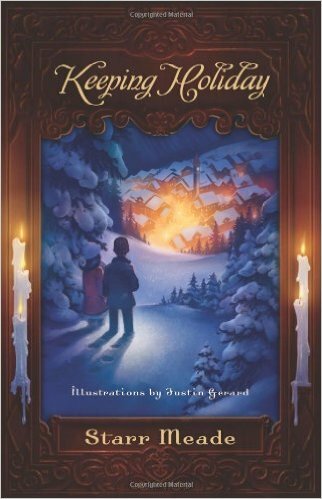 You can read my full review of Keeping Holiday here. All of the kids seemed to enjoy this title very much. If you are looking for a religious story that explains that we are in the "not yet" here on earth then this title is worthy of your consideration. Next we read Christmas with Anne because I wanted to. 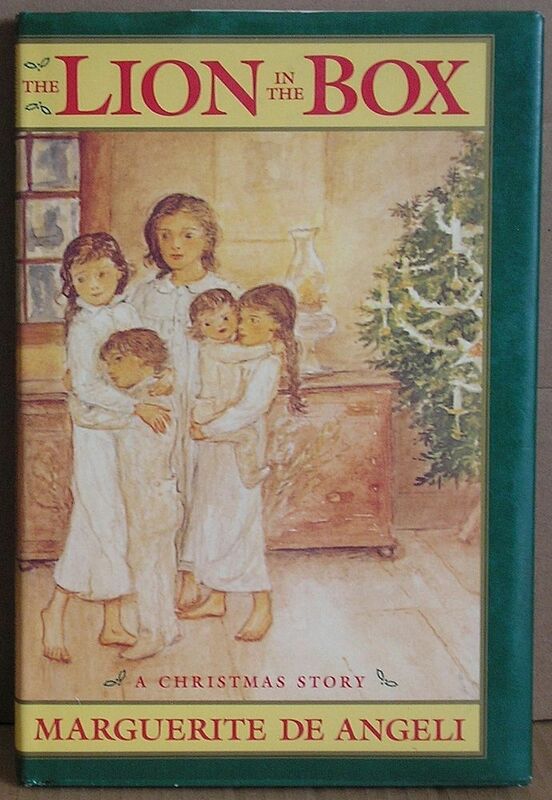 This book is a collection of short stories by Lucy Maud Montgomery that focuses on the holiday season. Our family spent the better part of this year working our way through the Road to Avonlea series and so it seemed appropriate to top the year off with some tried and true Montgomery. If you tell my kids that a story is "like" Avonlea or that it is from Prince Edward Island, the chances are you will receive an enthusiastic response in presenting the option. 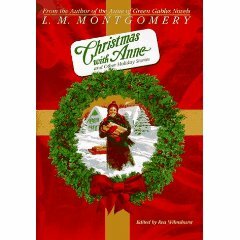 Anne does make an appearance in this book (the chapter in which she receives her puffed sleeves from Matthew) but the book is a compilation of short stories not pertaining to any of Montgomery's other books or series. The last time I indulged in this holiday read was back in 2008 so it was a nice visit for me as well. You can read my full review of Christmas With Anne HERE if you are interested in more information on this title. It can be a hard book to get your hands on, but if you come across it I highly recommend snatching it up! Last year was the first year that I had read The Best Christmas Pageant Ever aloud to my kids and they really got such a big kick out of it then that I didn't want to miss the opportunity to enjoy it again. I threw that into our Christmas mix on the heals of Montgomery and we had a good time with it. As I said in my review last year, this isn't a book that I necessarily want my kids reading on their own, even though they are quite capable of doing so. I edited out the same things in my read aloud that I did the first go around and no one was the wiser or the sorrier. If you are looking for a book to provide a good chuckle during the Christmas season, while still sharing the Gospel story, then this one is kind of a fun way to rehearse the Christmas story in a new way. (Don't replace your Gospel reading with this title by any means, but I think it's valid to suggest this title is a humorous way to retell the story while still being respectful.) 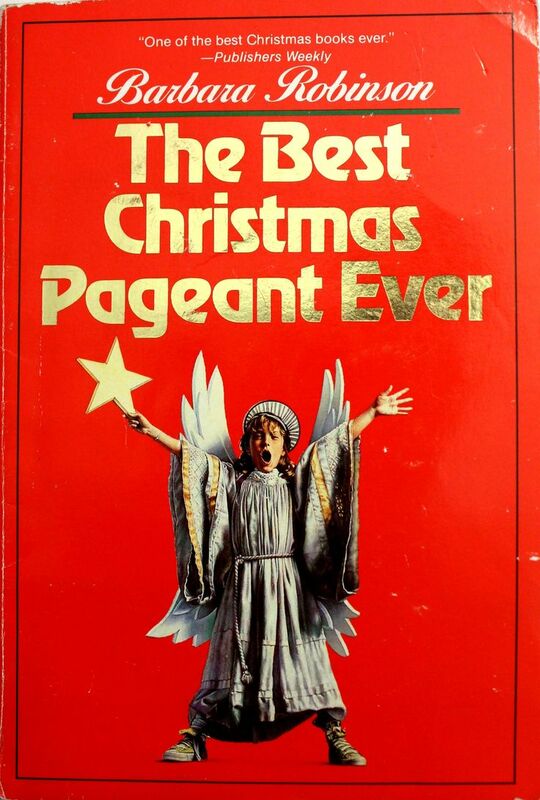 You can read my full review of The Best Christmas Pageant Ever here. A few years ago I picked up a copy of The Lion in the Box, by Marguerite De Angeli. We hadn't gotten around to reading it yet and so I figured on squeezing it in between reads. We read this one over the course of about two days and enjoyed it for what it was. I have to confess it wasn't my favorite but the kids all claim to love it and I can certainly understand why. This story is set in New York City around the turn of the century. It tells the story of a poor family whose father has died. The mother works three jobs to keep herself and the children housed and fed. Although the family doesn't have very much, they are a happy crew. One Christmas Eve the family is surprised to receive a large box which has come courtesy of a well-to-do lady who met the mother and sympathized with her story. I'm sure my kids' imaginations were completely in gear when it came to unpacking this enormous box of goodies. The moral of the story is to be cheerful in all things and also to believe in miracles which sometimes happen. It's pretty formulaic and cheesy but it's Christmas and provides all the warm fuzzies that you could possibly want. From a Goodreads perusal it would seem that this story has been loved by a great many people. If I had been thinking about getting rid of the copy, I may have been swayed into keeping it once I checked its availability on Amazon. 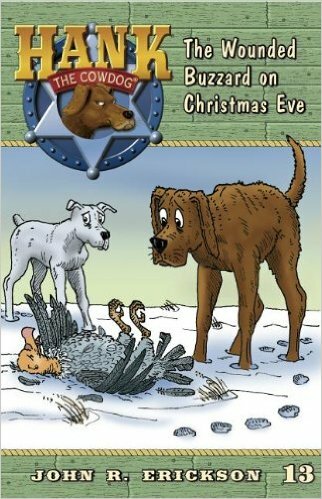 We're finishing up our Christmas reads with Hank the Cowdog and The Wounded Buzzard on Christmas Eve. This is admittedly an unconventional read but it has been a lot of fun nonetheless. I can't actually remember our last Hank the Cowdog read and I fear we might never have had one. Bookworm1 has read several titles independently but I have a sinking feeling that he's been the only one. As we launched into the read I realized that our younger kids weren't familiar with Hank, Drover, Slim, Loper and crew at all! Clearly I have fallen down on the job! I had to explain one or two things to them as we got into the story but, gratefully, this title can operate as a stand-alone if it must. (Listen carefully: No Hank the Cowdog book should stand alone. You should read a lot more than one.) In this particular story Wallace the Buzzard takes a nose dive into the windshield of Slim's pickup truck and a spirit of goodwill overtakes Hank and Drover in a desire to help the old buzzard out. Adventures abound (as does humor) throughout the story. Our kids are guffawing in all of the right places letting me know that Hank needs to occupy a larger place in our hearts in the coming year for truly, no childhood is complete without Hank the Cowdog. And these, my friends, are the stories which have occupied our imaginations this December. Some old, some new with an emphasis on fun, I think. Rather, it's been fun for us and I'm grateful for each story we manage to tuck in with this Christmas. How about you all? What have you been reading this month? I loved The Lion in the Box when I was younger and now I can hardly remember what happened in the story.